Online poker is extremely popular is Australia. Most poker sites are available to Australians. There are many reasons players choose the Internet over live games in the country. The biggest reason to play Australia online poker is that the rake is substantially lower than at cash games. Casinos in Australia charge $10 an hour and 10% up to $8 per hand to spread poker. That is absurdly high compared to the 10% up to $3 max that players at online poker sites generally pay. Online poker rooms also have far more promotions than brick and mortar ones. The first deposit at a poker site gives players a bonus that clears as rake is paid. There are guaranteed poker tournaments, leaderboards, VIP programs and special events that go above and beyond what any live poker rooms offers. Another reason to play at Australian online poker sites is the game selection. In addition to Texas Hold’em, you will find Omaha, Omaha High/Low, Seven Card Stud, Seven Card Stud High/Low, and Razz at most poker sites. Some sites also offer draw and mixed games. Many have hundreds of tables running at any given time. The limits are another reason to choose online poker over the poker rooms in Sydney or Melbourne. You can play over the Internet for just pennies. The smallest games are usually $.01/$.02. You can also find nosebleed action and everything in between. Do you like sit and gos? Those are plentiful at poker sites. You can usually play for $.10 or for hundreds of dollars. Satellites to live events in Australia are also played at poker sites with admin fees that are much lower than the ones charged by live poker rooms to enter the same tournament. PokerStars is the largest site in the world. It is available to Aussie players. While PokerStars has the most games, they are also the toughest to beat. It is hard to find a poker site with tighter games than PokerStars. For that reason, we recommend 888, the second largest poker site in the world. The games there are incredibly soft. 888 offers a 100% up to $400 first deposit bonus. There is also a no deposit offer worth $88. 888 built its business on understanding the needs of its players. It is in constant communication with its customers so that it can improve the experience on its platform of poker and casino sites. This helps it draw recreational players through social media. Sign up at 888 Poker. One of the best kept secrets in the online poker world is BetOnline, which is primarily a sports betting site. It also spreads a medium sized poker room full of loose American and Canadian players. The players at these tables are among the loosest in the online poker world. It is on the Chico Poker Network. New players receive a 100% up to $2,500 first deposit bonus. Sign up at BetOnline. All of the best ewallets are available to Australian players. Neteller is the most popular. There are no fees associated with making a Neteller deposit as long as the transaction is initiated in the poker room’s cashier. Australian Neteller deposits are accepted by Visa, Mastercard, bank transfers and POLi Payments. Skrill is also available in Australia. There are no fees charged when making a Skrill deposit. Visa, Mastercard, American Express, JCB, Diner’s Club, POLI Payments, SWIFT, and bank transfers are accepted. Withdrawals are paid via bank transfer and SWIFT. Some poker sites accept Visa or Mastercard directly. There may be charge a fee for direct credit and debit card deposits. The exchange rate may also be higher. Exchange rates vary from site to site and between ewallets. The rate is usually 3-5% and can change often. Compare rates between all options before initiating a transaction. All deposits must be converted into a different currency as no poker sites accept Australian Dollars. Neteller and Skrill are the best options for Australian online poker cashouts. The fees are less than $5 and depend on the transaction. The Neteller ATM card has an additional fee based on the bank policy. Ewallet withdrawals are typically processed in less than 24 hours. Bank transfers from ewallets take an additional day or two. ATM withdrawals are available as soon as the poker site has deposited the cash into the ewallet. Currency exchange rates may apply to withdrawals, depending on the method. Online poker operates in a gray area in Australia. There are no laws against playing the game. There are also no laws against sites accepting Australian players. There is a law that makes it illegal for online poker sites to market to Australian players. This is why there are no major advertising campaigns for online poker in the country. On the other hand, online sports betting in Australia is perfectly legal. There is a tax charged to the bookmaker on the action and it is a licensed activity. There is currently a bill introduced to help regulate online gambling in Australia. 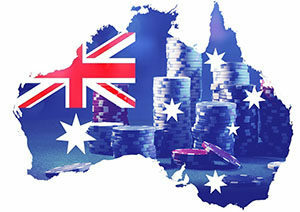 Do Australian online poker players pay taxes? The great news for Australian online poker players is that there are no taxes on gambling winnings. It is considered a leisure activity. Poker wins are considered luck, not income. Is PokerStars Available in Australia? Yes, Aussie poker players may create an account at PokerStars. What is the best Australian online poker sites? 888 is the best site for action to Australian players. New depositors receive a 100% up to $400 first deposit bonus. There is also a no deposit bonus that gives players $2 in cash, $6 in tournament tickets and $80 in pending bonus.